If you are looking for an exercise bike solution for your back pain, or not very comfortable with the traditional stationary bike, then an Exerpeutic Recumbent is the best one for you. This kind of exercise bike provides you the most comfortable feeling while cycling. Besides, it allows you to follow the best workout process with the best-advanced appliances. Let us come into some of the best products of Exerpeutic recumbent exercise bikes and choose the most suitable one for you. This exercise bike is an ideal choice for you. It is equipped with folding structure. This allows you fold it up to store after using conveniently. Then you will save more space in the apartment. The sliding desktop is large and can be adjusted forward, back, up or down easily. Moreover, you can adjust it as 3 different angles 0, 16 and 33 degrees, 5 different heights from 41’’ to 45’’. So it is considered to be the flexible semi-recumbent exercise bike. The bike also has the armrest which is made by soft foam and totally durable. So you can use the desktop easily and comfortably. That LCD computer also has a large screen for you to control the data about time, speed, calories burned, etc. Then, monitoring your body health and improving it is not difficult at all. Especially, the seat is designed to bring you the best comfort. It is about 2.5’’ thick and can be adjusted from 5’2’’ to 6’3’’ as long as it fit users’ height. In addition, the tension resistance is designed with 8 levels magnetic to control. It allows you to adjust whatever tension level as you want it to be. And, it also has the capacity of 300 lbs for durability. It will much greater for you to preserve your bike during your workout. The overweight people will be able to use it conveniently. The semi-recumbent design is designed to make you comfortable to finish your workouts effectively. + Armrest: it is made from soft foam and really durable to comfort you well. + LCD computer: allows you to monitor your body figures such as speed, calories burned, time, etc easily. Then you will have the precise decision of improving or keeping the current workout. + Tension Resistance: it contains 8 different levels allow you to adjust your workout to fit your body situation. + High capacity: it has a capacity of 300 lbs to keep durability of the bike. + This bike is not available for monitoring heart rate. 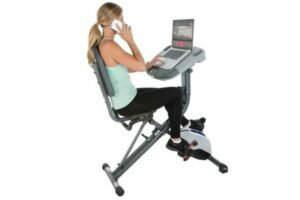 This Exerpeutic WORKFIT 1000 Desk Station Folding Semi-Recumbent Exercise Bike is not a bad option if you are looking for a recumbent exercise bike. It will help you practice and improve your body health well and comfortably. This exercise bike is considered as the best one with a pricey bill. It has a capacity of 400lb weight. This feature contributes the durability of the bike. So you can maintain it longer and more effective. Moreover, the bike is equipped with heavy duty and frame which is totally durable. The steel used here is kind of the best ones among Exerpeitic products. This makes the GOLD 525XLR Folding becomes one of the most desired recumbent exercise bikes. Also, it has the unique magnetic tension control system with 8 different levels. They help you control the data in the large LCD screen display easier. This computer shows your distance, your calories burned, time, Pulse, speed, odometer, and scan that you got. Then, you can control them simpler to reach the perfect workout result. The seat is improved so much. It is equipped with a large seat cushion also backrest for you relax. It fit for everyone in any size. So you need not worry about the comfortableness if you are overweight or too slim. Especially, it can be adjusted from 5’2’’ to 6’5’’ and definitely fit for tall people. On the other hand, you will enjoy the most relaxing time in this perfect seat. In addition, you can get on and off the bike easily by the semi-recumbent structure. And, the dual transmission flywheel allows you to practice with higher resistance workout. Thanks to this feature, you can challenge yourself with higher level to improve your body. And, this bike is specially designed with safety straps. They help avoid slipping while exercising and your cycling becomes more convenient and easy. + Large weight capacity: it reaches to 400 lb to ensure the durability ò the bike. + Heavy duty and durable steel frame: they make the bike running more durable and easy. + LCD screen: it shows your figures about your time, distance, your calories burned, Pulse, speed, etc. Then they will help you control your workout and then, have the best solution to improve further. + Advanced seat: the seat is equipped with the large cushion and backrest to give you the most relaxing feeling while cycling. + Semi-recumbent structure: helps you easier to get on and off when the start or finish the workout. + Safety straps: they help you cycle more convenient and prevent us from slipping out of the pedals while exercising. This Exerpeutic GOLD 525XLR Folding Recumbent Exercise Bike, 400 lbs offer the best cycling experience for you with many advanced features. However, it looks not very charming as others. This bike is equipped with a unique frame that can be folded to half size. It helps you save more space for your apartment even when it is not very large. Besides, it has a capacity of 300 lbs weight. That is not very small weight and can keep your bike more durable throughout using. And if you are a little bit overweight, you will not worry about that your weight will ruin the bike gradually. Moreover, the stabilizers for legs and large pedals which are designed with straps help them avoid tipping and keep you safe during your workout. Then, it is typically safe for you. And, this bike has the built-in grips right in the handles so as to control your heart rate during workout time. Also, there is a large LCD display tell you about your calories burned, speed, distance, length or even heart rate while you are exercising. This feature allows you control your figures smartly and accurately. So you can have the suitable workout to improve the body. In addition, this recumbent bike is designed with magnetic resistance that can be adjusted to 8 levels of tensions. It gives you more options for exercise to help you choose the best suitable for yourself. Then, the workout process will be promoted well. The seat is also advanced with cushion and the large backrest for your comfort. They are really the convenient features if you want to cycle in a long time (even short time). One thing about the warranty, this bike has a 1-year warranty. So if have any question or related problem with the bike, you can contact the maker and everything will be done free for you. + Capacity of 300 lbs: it helps the bike operate durable and safe. + Magnetic tension system with the adjustment reaches to 8 levels into account. This allows you to adjust your workout process in the most suitable way for you. + Seat cushion and huge backrest for you to be more relax and comfortable during exercising. This seems to be one of the essential things you should take a look if choose to buy an exercise bike. Because if you do not feel the most comfortable stuff, then your whole workout will be affected as well. + LCD displays your workout progress: it can show your speed, calories burned, your heart rate, etc while you are doing the workout. + Folding frame: it allows you to fold it into half of its size after using. So you can save more space for other appliances. + There is no bottle holder designed. This will be the big mistake for a good exercise bike. This Exerpeutic Semi-Recumbent Bike with Pulse is quite a good choice for you. It allows you do your workout with the most convenient and efficient. Moreover, it can save your space with the folding frame easily. In conclusion, these Exerpeutic recumbent exercise bikes provide you the most workout process to follow. They are all designed well with modern features to help you enjoy the exercise in the most way. And it will be a big mistake if you neglect them on your list.